Situated in one of Hawaii's oceanfront communities on the sunny Kohala Coast, The Puako Hylton Beach Villa offers the ultimate luxury retreat. With a new swimming pool being added December 1, 2016, this exotic Balinese-style home offers a unique floor plan covering over 4000 square feet of living space. Three master suites plus a detached Ohana apartment accommodates up to 10 people comfortably in this luxurious, contemporary home. All suites offer private entryways and incredible ocean views. The property is rented as a complete home, and the suites are not available individually. The Hula Suite is located ocean front, has a king bed with private bathroom including a soaking tub. This suite is suitable for two guests. There is a private lanai and entry. The Mango Suite is located ocean front with one queen bed accommodating two guests, with private bathroom, soaking tub and over-sized shower. This suite has a private lanai and private entry. The Plumeria Suite is a split level with one king bed on the lower level and one queen bed on the upper level. This suite accommodates up to 4 guests and has a kitchenette. There is a full bathroom with shower and its own balcony/lanai with ocean view. The Ocean Ohana apartment is detached from the main house, has a king bed, full kitchen, ocean view, private bathroom with shower, as well as a private lanai. Relax and rejuvenate each evening with a glass of wine or enjoy an evening of star-gazing along the beach front. Beach gear as well as an outdoor shower are just a few of the many amenities. WEDDINGS: Celebrate your once-in-a lifetime event with a magical celebration at the Puako Hylton. We work with local vendors to provide everything needed for your big day. Limit to 50 guests and available to guests who reserve the home for accommodations. There is a 5 night minimum stay requirement and a 10 night minimum during the Festive Holiday season. One mid-stay housekeeping service will be provided on a complimentary basis with each reservation. This is a non-smoking, no pets property. This property is compliant with Hawaii State Legislation (HB2078) for vacation rental accommodation Hawaii Tax ID: TA-01. Wonderful week with our children and grandchildren in lovely home in great location. 10 stayed here and 4 more joined us each night for dinner. Plenty of kitchen supplies, space, and pool made it perfect. Owner was more than accommodating and helpful. How can you miss with oceanfront and sunshine? Glad you enjoyed your stay in Puako - Look forward to your return soon! Incredible home in every way. It was spotless, perfectly maintained, and absolutely the greatest experience from start to finish. The weather was very warm during our stay, but the air-conditioning worked well during the heat of the day, and the openness of the home and ample fans allowed us to enjoy the evenings and the mornings without any need for AC. The secluded beach was fantastic as well. We enjoyed snorkeling right from the house. The house was stocked with everything we could possibly have imagined. You name it; it was there. And lastly, kudos to the owner, Nann, and her entire support staff (Jeremy, Chris, and Christian) for making the entire process from reservation to check-in to check-out a professional and wonderful experience for us. A best value for the price. We'll be back! This house was so beautiful and right on the ocean with a white sandy beach. The bedrooms were fabulous. We each had our own private suites and the great room area was fun for everyone. This house is not only beautifully designed in an island style but it came equipped with absolutely everything we needed. The gourmet kitchen was the best! It had beautiful tropical wood floors and bamboo ceilings. My family loved the sunset views right from our back yard. The management was great and so helpful, even set up massages for all of us right there in our lanai's. We stayed at the Puako Hylton over Thanksgiving week. Everyone loved the house and all it's many amenities. Clean and fresh throughout. Our group (nine of us from 15 to 68 years old) like many activities, this place is a short distance from many. Great beach and beautiful Sun Sets. Short hope to places to eat from resorts to pizza. Nann set us up as soon as we arrived, she has a great property with a great beachfront location. This property is more beautiful in person than in the pictures. The house was immaculately cleaned and maintained. The owner provided all manuals for operating appliances, TV's etc. 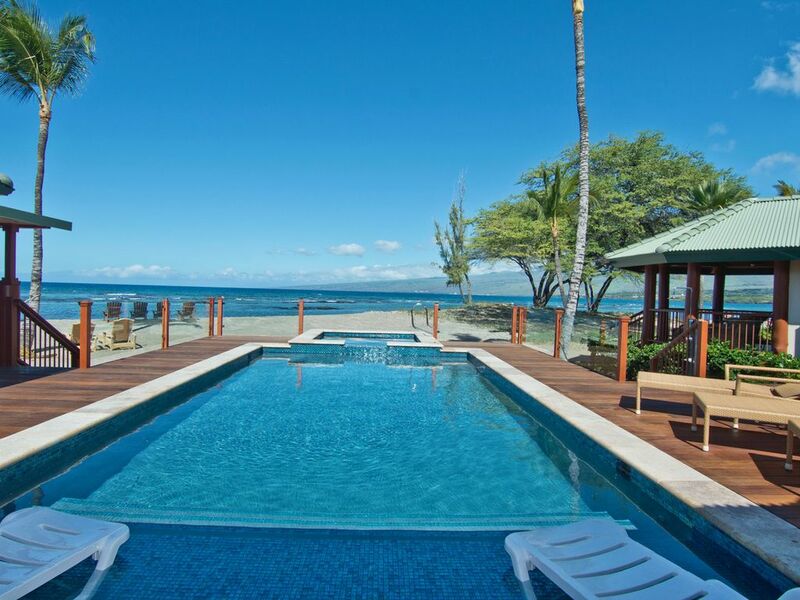 Conveniently located on the South Kohala Coast in a small community(Puako) nestled between larger hotel properties. I could have stayed at the house for the entire vacation. Puako offers great snorkeling, diving, and kayaking right in front of the house. This is a luxury property with all the amenities anyone would want or need. Nearby are many good resort restaurants and we found several local style dining options less than 30 min. away in the towns of Kawaihae, Hawi, Kapa'au and Waimea. There's also watersports within 15 min. My days at the "Puako Hylton" will long be remembered. I would recommend this property to anyone who appreciates quality beachfront living. Stunning beachfront villa everything we expected and MORE!!! Our one-week stay at the lovely Puako Hylton was absolutely magnificent! The beautiful Bali style home and property exceeded our expectations in every way, and the property owner could not have been more gracious and helpful during our interactions. Each day we were treated to humpback whale performances in Puako Bay, incredible sunsets, the Aloha of our Puako Hylton hostess, and the luxurious home and surroundings of this piece of heaven in paradise! We were provided many exquisite, unique and sumptuous dining suggestions from our hostess, as well as, details on island-wide sightseeing, local music and cultural activities available during our stay. All in all, we loved our stay at the Puako Hylton, albeit too short, and look forward, with great anticipation, to our next visit. $4,500 night, Christmas & New Years, Dec. 19th through Jan. 4th, 10 night minimum. $5,000 Security Deposit. Minimum nights stay required based on seasonality. $1,000 Departure Cleaning Fee. Balance due 60 days prior to arrival. *Prices do not include tax. 2 nights room + tax deposit due to confirm space. Perfect for Weddings and Special events, maximum number of guests is 50.